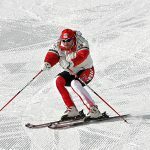 While World Cup technique has been widely discussed and shown in the photomontages on a number of web sites and on the pages of the “Ski Racing Magazine,” a lot of myths and misconceptions are still floating throughout a ski racing community. Some advocate “hip angulation” as a primary means of maintaining the pressure on the outside ski, others teach counter-balancing in the beginning of each turn and insist on “level shoulders all the time” approach, yet others even come up with innovative techniques, supposedly, best suitable for recreational racers, but somehow not yet discovered and used on the World Cup. 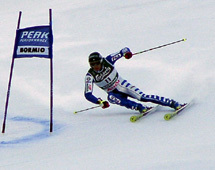 Many coaches of junior racers still excessively use drills for producing a pronounced break at the hip in the beginning of the turn for allegedly creating “a well balanced over the outside ski position.” Most coaches reinforce a strong “square to the skis position” as one of the fundamentals of an effective technique. Phase-III — after the fall line. In my opinion this breakdown makes a lot of sense when discussing different technical elements. For example, having “level shoulders” in the beginning of phase-I is not a good thing, while it is almost a must at the completion of phase-III. The same could be said about “angulating” or “counter-balancing” — too much counter-balancing in phase-I can be inefficient and slow, while it might be absolutely necessary in phase-III. In other words, in order to produce proper movement patterns in ski racers, we should not just throw different technical concepts around. We need to teach a particular movement for each of the phases of a turn. Another important aspect needed for understanding modern technique is balance over the ski. Many coaches talk about “balancing over the outside ski” out of the context of constant re-balancing that takes place practically in every turn. The skier should be balanced over the front of the ski in phase-I, then the balance area shifts towards the middle of the ski in phase-II and moves more toward the tails of the skis in phase-III. The most challenging part of this re-balancing is a quick re-centering between phase-III of the previous turn and phase-I of the next one. I call it phase-0, where a skier has to execute the re-centering movements in such a way that the pressure shifts toward the front of the “new” outside ski. 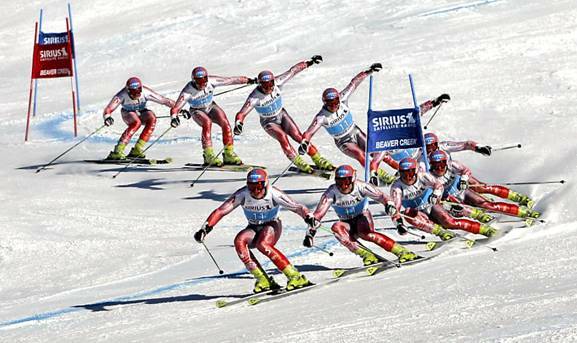 In this article, I will attempt to illustrate and explain what movements are performed in modern ski racing and how they are applied by some of the best World Cup skiers. 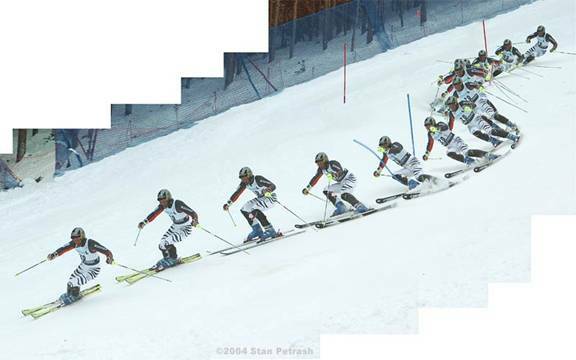 I will use mostly images of GS, but almost everything holds true for slalom as well. First I would like to take a close look at phase-I of a turn. in a matter of a few tenths of a second. Performing this movement in the gates with a certain degree of consistency requires superb strength and balance. The following sequence is taken by a camera that produces 10 frames per second. 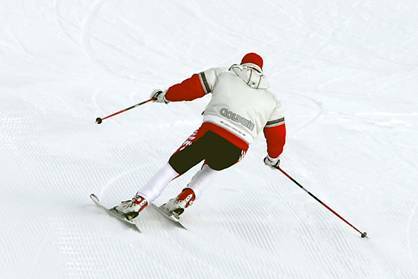 While entering phase-I with more weight on the inside ski compromises the skier’s balance, it can be commonly seen on the World Cup, because it produces the higher edge angle early in the turn often providing some speed advantages. Sometimes racers’ outside ski can be even off the snow in the beginning of phase-I. This movement is, in my view, incorrectly considered to be a technical element. Some coaches refer to it as “starting the turn on the inside ski.” In reality it is just a bi-product of an aggressive inclination in the early stages of phase-I. No racer on the World Cup deliberately tries to enter into a turn on the inside ski with the outside one up in the air. It can and often does result in falls or poorly executed phases- II and III of the turn. However, if a racer, just like the author in the following sequence, manages to re-center and get some purchase out of the outside ski prior to the beginning of phase-II it can be faster than entering phase-I with more weight on the outside ski but with less extension. In sum, it is important to understand that while more weight on the inside ski is acceptable in phase-I, excessive weight on the inside ski during phase-II produces a poorly executed turn exit in phase-III. In this turn, the author builds some pressure on the outside ski in phase-II in the fall line somewhere above frame 4 (from the bottom). Phase-III (last two frames) in this case is executed quite strongly and the skier appears to be balanced just as well as he is in phase-III of the following sequence, in which phase-I was executed with more weight on the outside ski. the skier still has the outside part of his body extended with shoulders being not yet leveled. The same skier had to start counter-balancing by leveling out his torso earlier in the previous sequence. Generally, remaining extended with the center of mass being well inside the arc of a turn throughout phase-II is faster. As well, it is apparent that the skier maintains the pressure in the middle of the ski. Counter-balancing in modern technique is achieved by leveling out the torso, which is normally performed a little above the gate or at the gate. 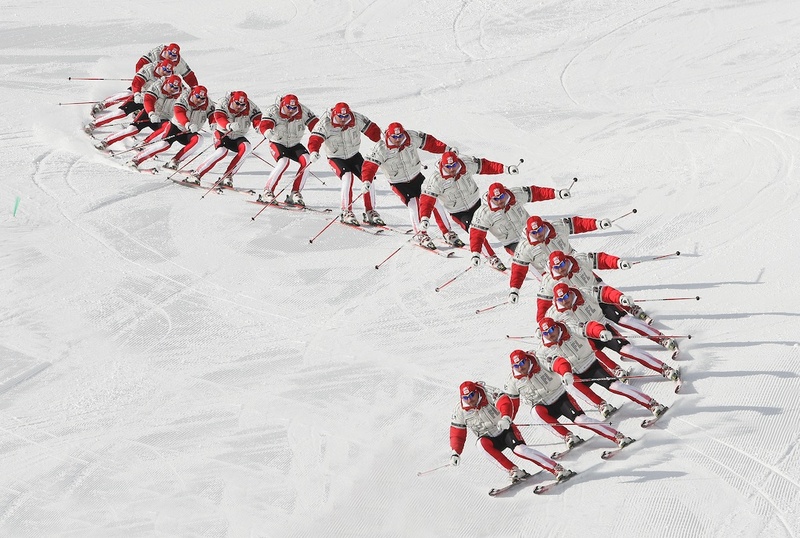 Let’s see how these movements are performed by the World Cup skiers. 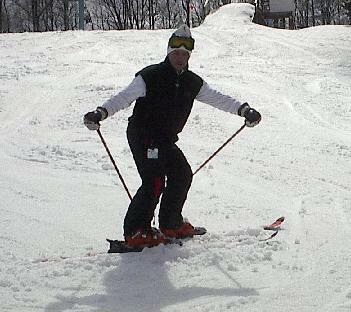 As it was demonstrated by the author, skiing with adequate balance allows creation of high edge angles above and in the fall line. It is perfectly demonstrated here by Frederik Niberg of Sweden (now retired) skiing in the Bormio World Championships GS. Here Niberg creates fantastic edge angles in phase-II entering the fall line above the gate by extending forward and inside the arc of a turn. Shoulders are not level and the arms are extended to the sides for balance. The basket of the inside pole is dragging on the snow. It helps the racer to sense the “boarder of a balance zone,” beyond which the grip on the outside ski may be lost and counter-balancing can be the only way to avoid falling to the inside. Niberg remains almost square to the skis and maintains perfectly parallel shins. It allows him to achieve almost equal edge angles on both skis. Note that the edge angles are never really equal as the outside ski is always more edged and loaded in phase-II. Building more pressure on the outside ski while in the fall line is a great secret of this fine balancing act. 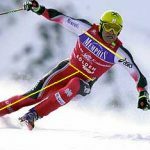 Many instructors and coaches do not fully understand how the pressure can be built on the outside ski without any angulation. Some arguments in favor of a strong angulation based on the physics of the process are often presented. However, proper re-centering in phase-0 and entering the turn correctly in phase-I produces a pressure build up on the outside ski by phase-II. In my opinion, it is the most efficient and natural way to ski. Maintaining strong extended position throughout phase-II produces the most speed out of the fall line into phase-III. Notice that while Niberg’s outside leg is extended and the inside one retracted, both knee joints are in the functional “unlocked” state. This way the racer can absorb the terrain and maintain the edges in a constant contact with the snow surface. Niberg is shown here in the beginning of phase-II where pressure builds mostly on the fronts of the skis. It is achieved by proper re-centering performed by the beginning of phase-I. At this point the racer should feel more pressure on the ball of the outside foot and really feel the tongue of the inside boot against the shin. I believe that the next photo sequence is one of the finest demonstrations of the modern technique. 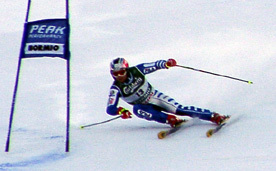 Thanks to such a great technique, Niberg was able to win GS races on the World Cup at the age of 36. 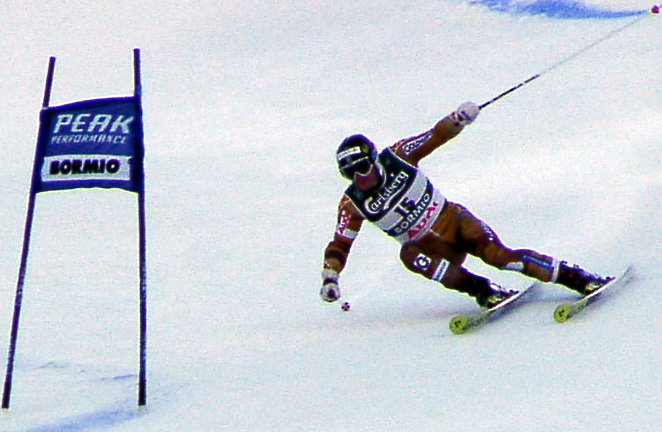 He placed third in the overall GS standings in his last year of competition. I hope that it can be clearly seen from this sequence that the racer’s entire body moves inside the arc of the turn (i.e. inclines) throughout phases-I and II (above the blue gate) with the outside part of the body being extended and without a hint of any counter-balancing actions or angulation. It is important that while inclining the racer’s torso does not get ahead of his lower body or gets left behind. Otherwise the movement would result in leaning onto the insides ski and loosing the grip on the outside one or getting stuck in the static angulated position. Instead, Niberg continuously moves inside the arc of the turn and increases the edge angle throughout phase-II of the turn while his shoulders are not level (see four frames above the blue gate). In phase-III (frames at and after the blue gate), the racer starts leveling out his torso which produces “level shoulders” position by the completion of phase-III. So, out of about nine frames, the racer has level shoulders only in two of them. I view it as one of the prevalent tendencies of the modern technique. Another important one is a lack of hip angulation or any other angulation for this matter. Counter-balancing is performed in phase-III by simply leveling out the torso. No deliberate angulation-like movement is present. The best illustration of this tendency of the modern technique is presented by the frame 3 from the bottom right before hitting the blue gate. Even at this point the racer remains fully extended with shoulders not being level. Taking a close look, one can notice that the turn around a red gate above is executed by Niberg in exact same manner. 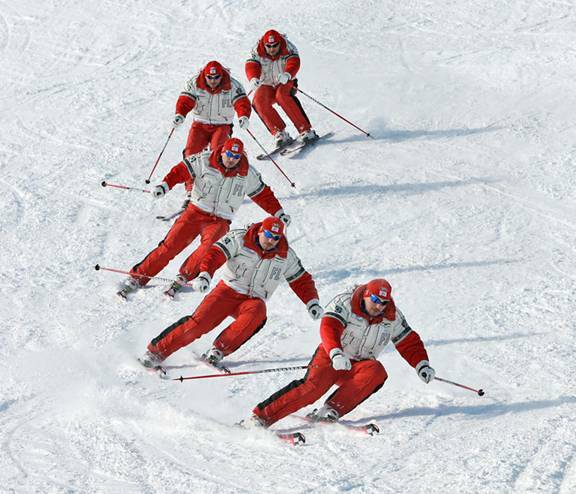 The racer remains square to the skis throughout phases-I and II, then really comes out of the square position at the completion of phase-III. 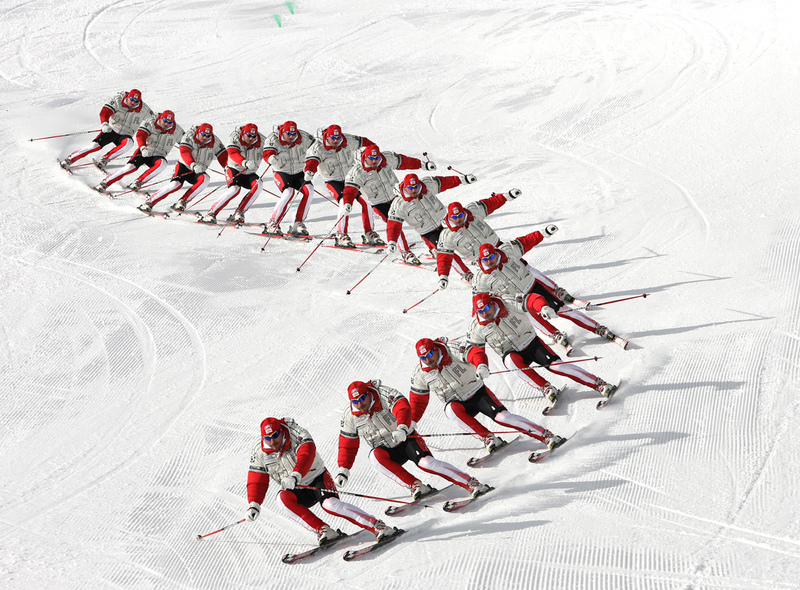 In phase-0, he is not square as skis move under the body to the left and the torso is facing toward the fall line. It is a very important aspect of the modern technique that needs to be understood by advocates of an “always square position.” In most of the turns executed by World Cup racers some counter-balancing movements are present typically in phase-III, but, in my opinion, no deliberate angulation like the one enforced by some coaches is performed. One can say that a modern turn is executed by re-centering and extending to inside of an arc of a turn with subsequent counter-balancing performed in the final stages of the turn. I would like to support these statements by these pictures taken at the exact same gate as Niberg above. Although Max Blardone of Italy (left) is short and somewhat stocky (just like Niberg) and his teammate Manfred Moellg (right) is tall and skinny, the completion of phase-II of their turns looks very similar. 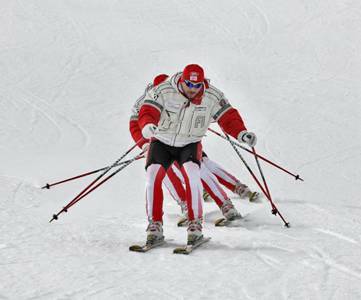 Both racers keep their shins parallel and skis almost equally edged. Both maintain the pressure in the middle of the skis. One may suggest some hints of counter-balancing in both racers, but no angulation is present. In my opinion it is impossible to achieve a more natural and balanced position in phase-II of a turn. In fact, both racers exhibit fantastic balance having the right hip within inches off the snow. Same as Niberg, Cuche inclines into the turn and really engages both skis in phase-II (third frame). Even, as he passes the gate (last frame), Cuche does not exhibit any signs of angulation. What may appear as a hip angulation, in reality is just a result of leveling the torso. The outside leg is extended while the inside leg is retracted to a point where the inside hip almost touches the snow. The counter-balancing executed by leveling out the torso allows Cuche to maintain a lot of pressure on the outside skis that is really bent into an arc. 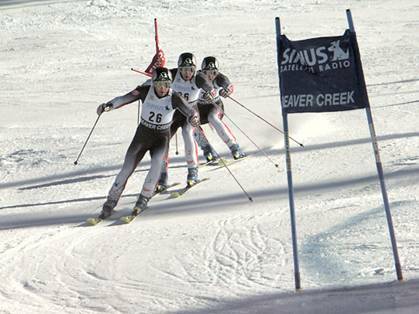 Another sequence of Cuche at Beaver Creek is taken from a different angle. I think that the photo sequences taken from this angle contribute to some misinterpretations of modern technique. In essence Cuche employs the same technique here as in the turn shown in the sequence above. However, shown here is a flatter section of the course. The racer does not carry as much speed approaching the gate and, therefore, needs to employ more pronounced counter-balancing movement in phase-III (two last frames at the gate). Nevertheless, this movement is the same – it is just produced by leveling out the torso between frames 3 and 4 (from the top). In my opinion, it is another display of a modern technique at its finest. However, even the best racers can not always execute these kinds of turns in GS. They do need speed and a certain pitch. The most effective are the turns when the racers manage to engage the shovels of both skis in the beginning of phase-I as demonstrated by Niberg and Cuche above. The key to it is re-centering performed in phase-0 when racer’s center of mass moves forward toward the fall line while skis move under the body. 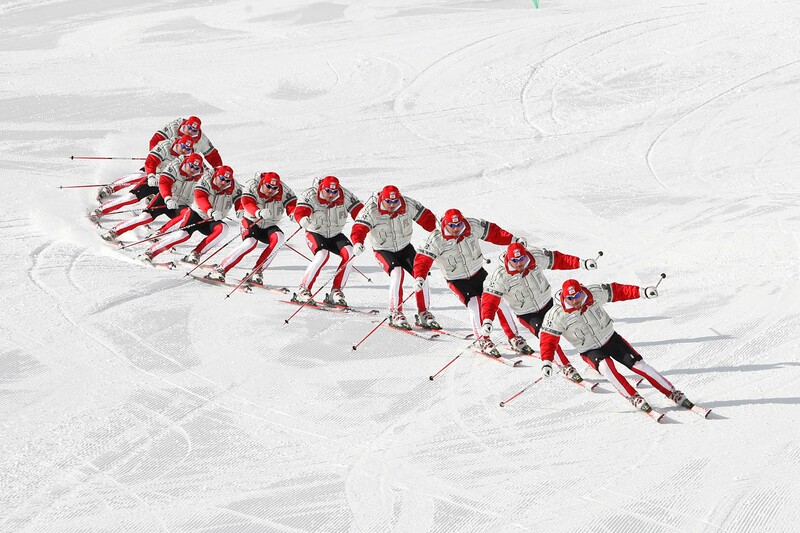 These movements are clearly seen in the photo sequence of Reiner Shonfelder (Austria) racing through World Cup GS in Beaver Creek. Shoenfelder is balanced over the tails of the skis in phase-0 (first frame from the top). The skis loose contact with the snow in frame 2, but by the time they engage the snow in phase-I (frames 3 and 4), the racer is fully re-centered and the shovels of both skis start carving above the fall line. 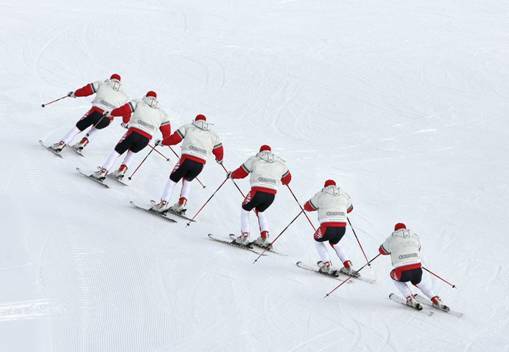 One can also notice how the racer in this sequence goes from being square to the skis to having his torso facing down at almost 45 degrees to the direction of his skis. Once again, it shows that “maintaining a strong square position throughout the entire turn” is just a myth. Perhaps, re-centering can be more clearly seen from the following sequence, where author demonstrates a shallow turn on a moderate pitch. 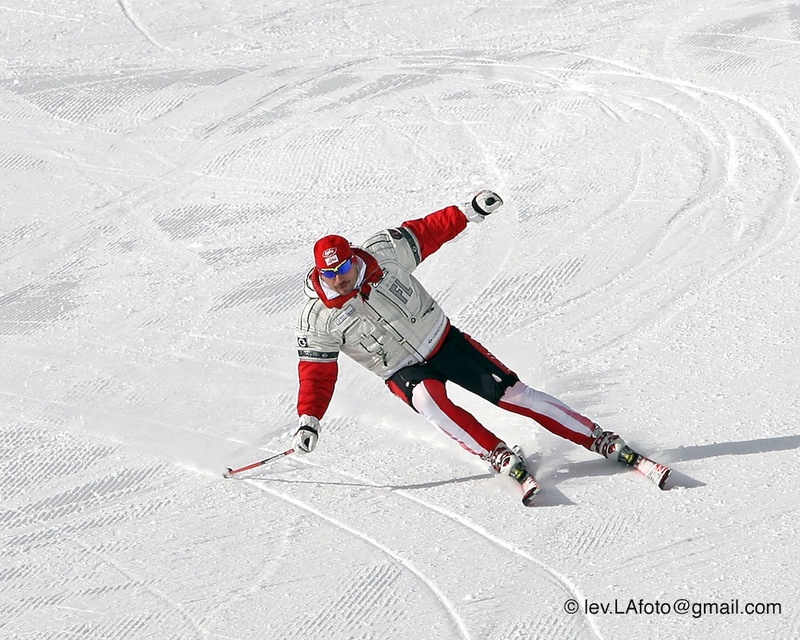 In a first frame the skier is balanced over the tails of the skis at the completion of phase-III of a previous turn. Re-centering takes place in phase-0 (somewhere between the second and the third frames), and by the time the skier completes phase-I (frame 3) he is fully re-centered and ready to engage the shovel of the outside ski and bend the ski in phase-II (frame 4). Even faster re-centering is needed in the gates as demonstrated by Stephan Goergl of Austria in the next sequence. I guess, this short sequence does not require any comments. In the first frame the racer is balanced over the tails of his skis (phase-III of the turn around the red panel). In the last frame Goergl is re-centered and enters phase-I with some pressure on the shovels of both skis for carving an arc around the blue gate. 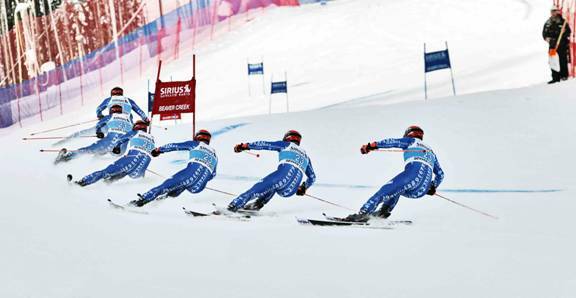 Slalom turns take much less time and are harder to divide into phases visually, but the same phases of the turn are there in slalom. 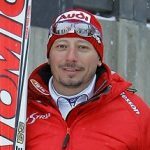 Furthermore, modern slalom turns are executed very much the same as the GS ones, yet there even more myths related to slalom technique are floating around. 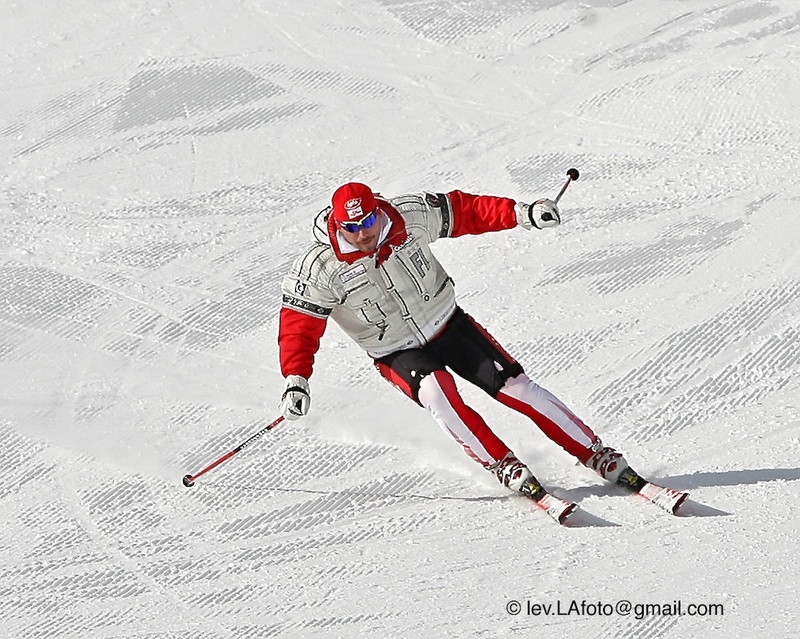 However, even the difference in the appearance of a slalom turn is not that great, as demonstrated here by the author. This is a phase-II of a slalom turn. The outside part of the body is extended and shoulders are not level. The same movement is exhibited by leading slalom specialists Marli Shields of Austria (left) and Tania Putianen of Finland (righ). 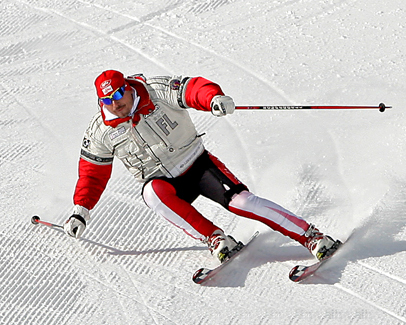 Both skiers are shown here while executing a phase-II of a slalom turn with minimal counter-balancing. 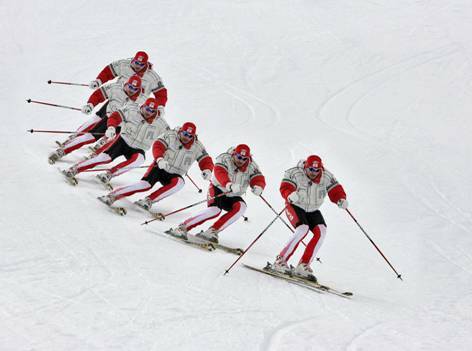 In slalom the extension of the outside part of the body is less pronounced and counter-balancing is more apparent. Yet the mechanics are very much the same, as shown here by the sequence, where the author demonstrates a slalom turn outside the gates. Once again, the shoulders are level, but the torso is not square to the skis at this point. 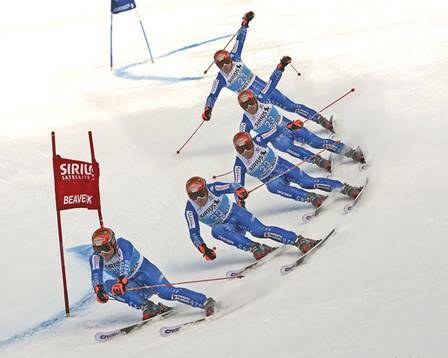 In phase-I (4th frame above the blue gate) the racers inclines while being square to the skis and having shoulders not level. The outside part of the racer’s body is extended and the shins are parallel. However, the extension of the outside leg is not quite as evident as it would have been in phase-I of a GS turn. I think this is the only real difference between modern slalom and GS turns. The rest is practically the same. In this sequence, Vogl continues to move inside of the arc of the turn up until he clears the blue gate at the completion of phase-II. The racer only levels out his torso after clearing the gate in phase-III (frame below the blue gate). Notice, that like in the GS turn, the skier’s torso is not square to the skis in phase 0 (second frame below the gate). 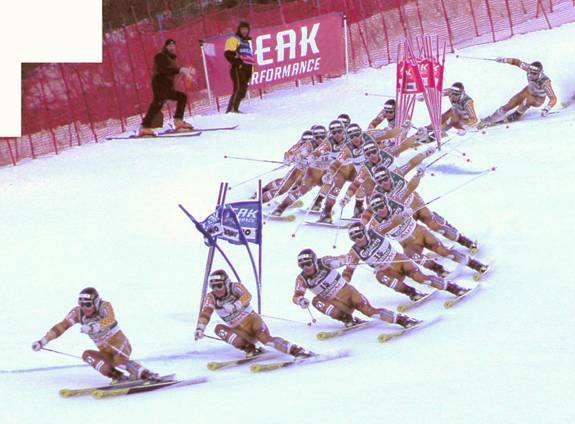 I believe that in comparing this sequence of Vogl in slalom with the sequence of Niberg in GS discussed above, one could find way more similarities than differences in their technique. In conclusion, I would like to repeat that most of the myths related to modern ski technique can be true, if taken in context of the particular phases of the turn. None of them are true otherwise.